Last weekend as the world converged on The Bahamas for the 2014 staging of the annual beer festival dubbed ‘Beerfest’, held this year at Marsh Harbour on the beautiful island of Abaco; Dancehall superstar Demarco was tasked with the responsibility of keeping the thousands in attendance thoroughly entertained. The annual festival sees more than fifty craft brewers from around the country in attendance, pouring samples of over 100 of their finest brews—the 2014 staging boast an impressive roster. Which included new and award-winning breweries from Long Island as well as stellar craft breweries from across the country. 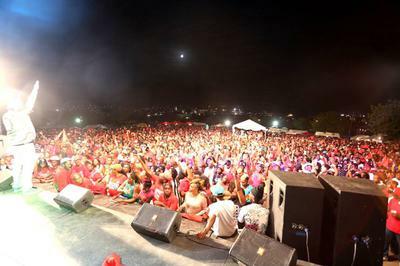 With socialites in their element and brims overflowing with brew this proved quite an unexacting undertaking for the Jamaican who has grown accustomed to performing for large gatherings internationally. Commencing his hour-long set Demarco delivered a carefully crafted presentation blending classics such as True Friend, Fallen Solider, Duppy Know Who Fi Frighten and I Love My Life with newer hits like Nuh Dirt, Love A Come Down, Lazy Body, Continue Whine, Rise To The Top, Bad Gyal Anthem and Good Book providing the perfect balance for the esteemed gathering whose fanfare bore testament of a performance well received. From there Demarco returned to North America for a media blitz in Canada before making a concert stop in Kansas City’s South Town Pavilion. On Saturday he was given headlining duties alongside soca sensation Kevin Little at the 2014 African Magazine Music Awards (AFRIMMA) in Dallas Texas. AFRIMMA is the sole award ceremony in the Diaspora that caters to all musical genres including but not limited to: Afrobeats, Assiko, Bongo, Decale, Funana, Genge, Highlife, Hiplife, Kwaito, Lingala and Soukous. Locally, Demarco is gearing up to release the official video for the Zj Dymond produced ‘Bad Gyal Anthem’ featured on the Promiscuous rhythm. The visuals were shot by True Gift Entertainment (TGE), also the video for the infectious ladies anthem ‘Lazy Body’ this week surpassed the million mark on Youtube only months after its release.